My iPhone has had nine lives--maybe more--thanks to its case. But for all the years I've had an iPhone I haven't much cared what the case looked like. Until now. Strangely, all of a sudden, I am hyper-aware of what my case looks like and that of everyone else, too. That's because your choice of case can say so much about you--i.e., your style, humor, passions, etc. And the fun thing is that you can change it up all the time. Crazy as it is, I'm currently digging the knuckle ring brass holder, above. But it's not really me. So I'm toying with these options from a monogrammed case to an old-school surfboard-inspired cover (my husband would approve! ), to a conversation-starting camera-printed one. I'm glad I found your blog! The lovely shout out in Lucky lead me here. I agree - I want my iPhone case to reflect my personal brand - and it still needs to roll business professional (because I am not going to change out cases like I do purses). Best to you! I completely agree with you that your iphone case says a lot about you. Its also fun to have a bunch of cases to switch on and off every so often depending on your mood and outfit. I must admit that I love "naked" Iphone. It is just too beautiful to be hidden and a case is just doing that. But, I do have an inexpensive case (see through so it can shine its own beauty) that keeps my phone protected, light and slick. I have a monogrammed one very similar to your link. Love it! On a different note, can you post pics of you with your Clare Vivier navy duffel bag. Want one, but not sure what size to get. Thank you! 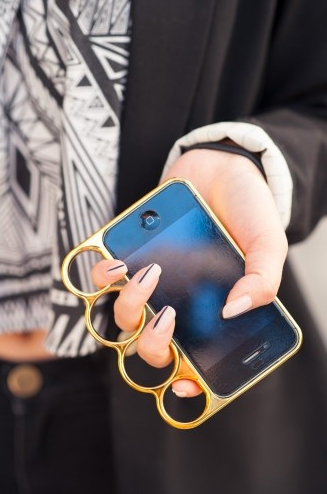 Ok, I kind of love that brass knuckles case! Who makes the brass knuckles case? where can we find the brass knuckle case? ?